In Florida, a “golf cart” means a motor vehicle that is designed and manufactured for operation on a golf course for sporting or recreational purposes and that is not capable of exceeding speeds of 20 miles per hour. 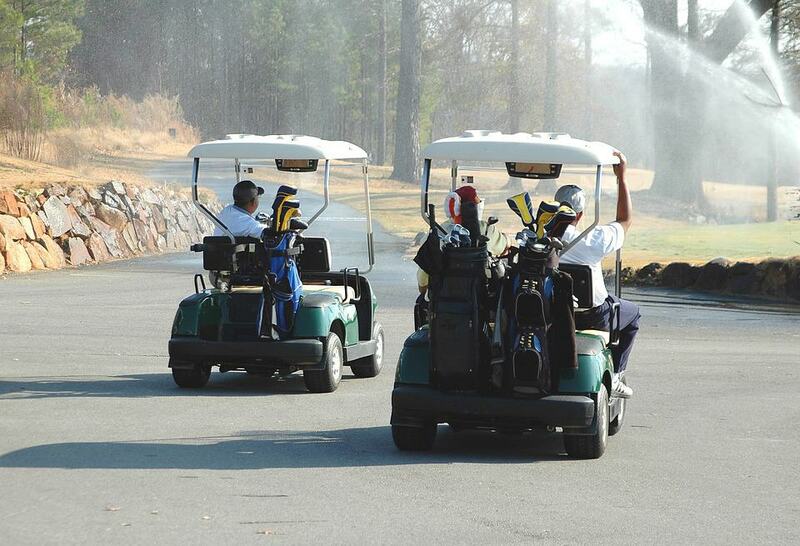 A golf cart may be operated on a county road or a municipal street that has been designated for use by golf carts. There should be appropriate signs on the road to indicate that such operation is allowed. A golf cart may be operated to cross a portion of the highway which intersects a county road or municipal street; to cross, at midblock, a part of the highway where a golf course is constructed on both sides of the highway; or to cross a street or highway where a single mobile home park is located on both sides of the street or highway and is divided by that street or highway (this only applies to residents or guests of the mobile home park). There should be appropriate signs on the road to indicate that such operation is allowed. A golf cart may be operated on a road that is part of the State Park Road System if the posted speed limit is 35 miles per hour or less. A golf cart may be operated only during the hours between sunrise and sunset, unless the responsible governmental entity has determined that a golf cart may be operated during the hours between sunset and sunrise and the golf cart is equipped with headlights, brake lights, turn signals, and a windshield. A golf cart must be equipped with efficient brakes, reliable steering apparatus, safe tires, a rearview mirror, and red reflectorized warning devices in both the front and rear. A golf cart may not be operated on public roads or streets by any person under the age of 14. A local governmental entity may enact an ordinance relating to golf cart operation and equipment.